The need for portable construction storage containers in Las Vegas NV means you need to turn to the friendly folks at Haulaway Storage Containers. 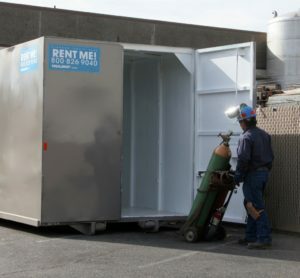 They aren’t just the right name for construction storage for rent; they are the best choice you can find to ensure you have the storage solution you need. Their motto of offering the best service in the industry means you’ll have a container delivered to your home, business or construction site the very next day. This allows you to enjoy the benefit of the containers you need right away. In some cases companies that offer construction storage for rent aren’t able to deliver a unit within a few days, which can delay the start of your project. With Haulaway Storage Containers you can have the construction storage containers in Las Vegas NV right away and get to work on whatever project you have in mind. Whether you need several large containers for a major construction project or you need a small one for your home remodel Haulaway can deliver exactly what you need to be able to get started on your construction project the very next day. The containers from Haulaway come in five different sizes to make it easy for you to enjoy the right storage for you. These sizes include ten, twenty, twenty-one, twenty-six and forty foot containers that give you the space you need to house what you have for your project. This variety allows you to have the size you need for construction storage for rent to give you the space for your items during your project. Choose Haulaway for the construction storage containers in Las Vegas NV that will make it easier for you to enjoy your storage solution.